Welcome to Analytics Canvas’s Changing Data Sources tutorial. This is one of a number of detailed tutorials in which we explain how each feature within Analytics Canvas works, with additional context to help you understand Analytics Canvas better and to use it to best suit your own needs. This article explains how to change data sources. The ability to replace a data source is very useful; the process becomes particular handy if, for example, you’re using a small sample of your data to build a proof of concept before switching to a full dataset. Here we have a simple data preparation process. Our Excel file contains a large number of repetitive rows. Using the Make Unique block, we can locate unique rows and export them into another Excel file. We can replace the data source by creating a fresh connection to the new source and then connecting the new source to the analysis. First, we’ll add a new data source. Click on the Data Sources tab on the Navigation menu. Click on the New Source button, and select a new source type. In our example, this is an Excel File. Open a new file, select the columns you need, and click OK.
Now we have two data sources on the Main Canvas. To switch these, we’ll right click on the existing connection between the first data source and the Make Unique block, and select Delete Connection. Now hover over the connection stub on the second data source, and drag the new connection to the Make Unique block. Since we don’t need the original data source anymore, we can delete it, by right clicking on it and selecting Delete Block. Now everything looks as it should. Click on the Run button on the Navigation menu to run the process, and write to the export Excel Workbook. Note that we have the same column names in both data sources, so replacing the source was relatively easy. If one of the columns was missing, however, or named differently, we would have to replace the references in the data transformation blocks. In this case, we would have to change the configurations of the Make Unique block by clicking on it and selecting column names from the list. 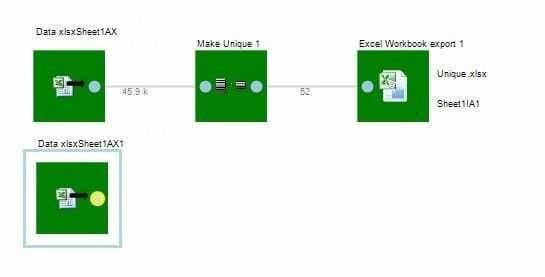 Learn how to connect to your Excel files in Analytics Canvas.